Happy Valentines Day! Bring your partner to a brunch like you’ve never experienced before! Complementary Champagne, Mimosa, or Kir included. 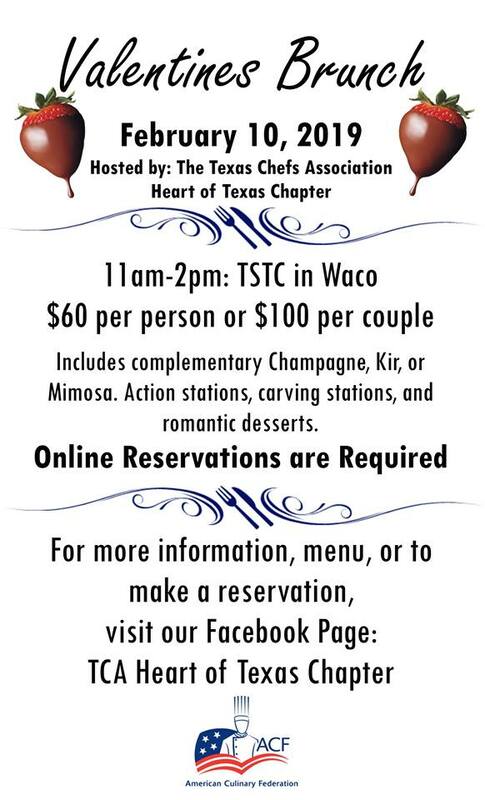 Hosted by the Texas Chefs Association, Heart of Texas Chapter. We will have action stations, carving stations, and romantic desserts during your dining experience. There are two seating times. 11 am and 12:30 pm. For more information, seating times, menu or to make reservations (reservations are required on-line – tickets will not be sold at the door): Tickets & Reservations: Tickets and Reservations $60 per person or $100 for couples.